Blog Post: Why I’m Launching this new Tuesday Hip Hop Night | DJPetey.com!!! I feel like this could use an explanation. A few weeks ago, we launched a new night in Boulder. 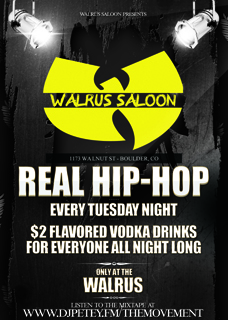 Every Tuesday at the Walrus, we pay tribute to authentic hip hop. This is not the typical open format party you’re used to if you come to my other nights. I want to explain why though. I feel like this is necessary right now. Necessary for Boulder and necessary for music in general. We are going to be doing artist showcases, emcee battles, and much much more. This is going to be a weekly show where you can come watch actual live hip hop. And hear hip hop that isn’t being played anywhere else with NO COVER CHARGE. And, we are giving EVERYONE $2 flavored vodka drinks ALL NIGHT LONG. I could have very easily promoted a drink special for ladies and thrown another party on Tuesdays, but I wanted to do something that adds to Boulder’s culture. This is about creating a new group of people who want to come hang out and meet new people. Not about seeing the same people you saw last night. If this sounds like you, come check us out! And if its not you, all of my other nights will continue to be the crazy party you’ve come to know. Hopefully you’ll come rock with us one a Tuesday though and find out for yourself.